Beachcomber hot tubs are made in British Columbia, Canada and sold worldwide. Caring for your spa filter is important to keep the health and clarity of your water up to par at all times. But at some point, your filter in that Beachcomber spa will have reached the end of its lifespan, regardless of how well you care for it. Paying attention to the integrity of your spa filter is important in order to know when it’s the appropriate time to change the filter before it breaks down to a point where it has already compromised the cleanliness of the water. Making sure that you replace the filter at the right time is essential for adequate spa water maintenance. Most spa owner’s manuals suggest changing them every year. These filters are basically the spa’s first line of defines against impurities in the water that can cause it to become filthy, bacteria-laden and filled with algae. Of course, cleaning these filters is important. 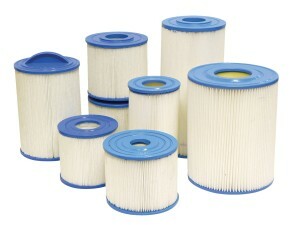 But it’s also important to have spare filters on hand when the time comes to replace it. Filters should be cleaned every 7-10 days, and deep cleaned every 3 weeks or so, usually by soaking overnight in a filter cleaning solution. Filters should be replaced every year or so (unless you are alternating 2 – to allow one to be cleaned and dry while the replacement filter is in the spa). If you own a Beachcomber spa, then matching the filter specifically to your tub’s requirements is essential. Beachcomber hot tubs are quite popular. However, buying the replacement filter at your spa dealer can cost you a lot of money. If you are in need of Beachcomber spa filters and live in Canada, Spa Filters Canada is your go-to place for everything you need. They carry a variety of Beachcomber replacement spa filters and cartridges and also offer very best in spa filter cleaners, hot tub accessories and more! Spa Filters Canada also makes it super easy to search for the specific item you require. Simply search by model number and size to help locate the exact Beachcomber spa filters you need. If you still have trouble, you can contact them directly and have one of their experienced and knowledgeable customer service representatives help you find the filter you need for your tub. Visit www.SpaFilters.ca today and find the best deals on top quality Beachcomber spa filters! If you are in the U.S., contact us by email at info@discounthottubspas.com for discount hot tub filters in 4-packs. If you don’t see the model you need, just send them an email and they will get it for you as we are also wholesalers. Different brands of hot tub filters include Blue Whale, Pleatco, Filbur, Unicel, and other filter manufacturers and distributors that use quality Reemay filter media.